I have been attracted to Deborah’s art since, as a graduate student, it was introduced to me through the SoulCards. I went on to get my Master’s Degree in Sacred Cinema from Naropa University-Oakland. My thesis film, Rebirth of the Authentic Voice, had been completed and I was looking for my next project when a very authentic voice started to burn in my chest. It was this passion about Deborah’s art that seemed to be calling heatedly. I began to nurse this little flame and was encouraged to ask her if I could do a documentary. She indicated she was interested and right there began this incredible journey. We said yes to the calling. I quickly began to talk with funders from PBS (P.O.V. and itvs). It seemed to fit with their guidelines so I pursued the idea. Deborah and I thought that starting with the 10th Annual Gathering would be the perfect way to open ourselves to the depth and spirit that the film should attempt. That was in early July. Things began to happen very quickly after that. As you probably already know, this is how spirit works when you are open to it. 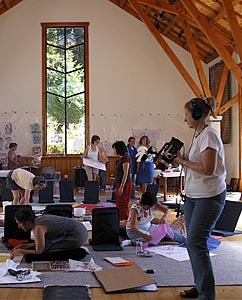 I attended the Gathering and met an amazing group of people who are not only doing Touch Drawing, but are facilitating and bringing this art form to others who are benefiting from this new form of expression. In attending the Gathering, I brought along my trusted camera, who slowly became an integral part of the activities. We even gave her the name “Mandy” in honor of the three Amanda’s who attended. We discovered that the name Amanda means “deserving of love” and love was given. On the first day, Mandy sat in the corner and came out for brief sneak shots of people deeply involved with their drawings. On the second day, she had crept closer to the circle but was still quietly observing. Slowly but reverently, in the environment of Touch Drawing, Mandy became a vital participant in the Gathering. People talked openly around her and to her. They shared their experiences with Touch Drawing and with Deborah’s art in a most profound way. They helped me to find the tone and spirit of the documentary that is coming. Since the Gathering, I have been pursuing the funding. I am now in the process of creating a trailer from the experiences at the Gathering to accompany applications. Deborah and I will be working on the plans for the rest of the video during the next few months. 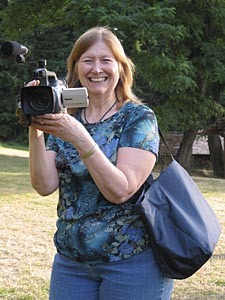 This will involve gathering footage from other classes she is teaching, as well as footage of the work being used by others in a variety of situations, and possibly a demonstration conducted in a sound stage. Additionally I will attempt to bring some of the deeply spiritual art work that has already been created by Deborah to a broad television audience. What a wonderful way to begin what looks to be an amazing journey with Deborah and the art of Touch Drawing.